Ulysse Nardin was founded in 1846 and, over the next 150 years, the watchmakers had received 18 gold medals and more than 4,000 other awards for their technology and craftsmanship. The company is noted for maintaining close relationships with the top scientists and inventors throughout its history, thus assuring excellence and state-of-the art creations. * The Trilogy of Time series includes an astrolabium, planetarium and tellurium wristwatch. This piece is without match in the industry. * The Freak watch has an 8-day tourbillon carousel with no hands or dial. 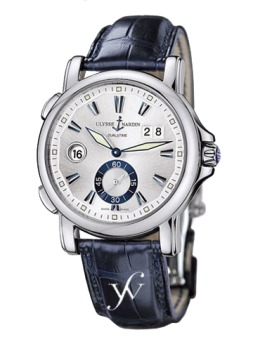 * In the 1980s, Ulysse Nardin developed a revival of the cloisonné watch, an art form that was believed to be lost. * For the 150th anniversary, the Perpetual Ludwig was created. This is the first watch in history to allow both forwards and backwards adjustments of all calendar displays. Maxi Marine Chronometer This fine watch has an officially certified chronometer movement, 42 hour power reserve indicator, and oversized seconds-hand. It is self-winding with a screw-crown and water resistant to 200 meters. The silverized dial is set in an 18 carat rose gold case with a sapphire crystal, completed with a leather strap with a deployant clasp. GMT: Perpetual The perpetual calendar of this beautiful watch can be adjusted forward and backward over the single crown. A second time zone is featured on the main dial, equipped with a patented quickset. The permanent home time is displayed on a third hand and the date is viewable through a big double window. This piece features a 48 hour power reserve in an 18 carat rose gold case, with a sapphire crystal and leather strap. Michelangelo: Gigante UTC Dual Time Limited Edition The Michelangelo collection features a wide range of the technical breakthroughs from Ulysse Nardin. The Big Date model, for example allows a double window for date display - readable at a long distance. This special Gigante Limited Edition includes a self-winding movement with unique time zone quickset and a permanent home time display. The case is 18 carat white gold and the dial is blue with a sapphire crystal. Only 100 pieces will be produced of this exquisite Limited Edition.